Located in picturesque western New Hampshire, Horton’s Farm is one of the most fully equipped and respected horse training facilities in our region. Our trainers are able to provide training components that will teach your horse to accomplish more and more complex tasks. As soon as a foal hits the ground, training begins with daily handling, picking up feet, leading and manners. Though there isn’t a lot to do at this young age, consistent and kind handling builds trust. In an ideal world, the next step of training begins at age 2, with bitting and wearing tack. It is important to have the wolf teeth removed before bitting as the teeth interfere with the bit and cause discomfort. Fall is a good time of year to begin training for the breed shows coming up in the spring. The foals are judged on conformation, movement, attitude, and manners. Your young horse will score better if he knows how to walk and trot in hand. Don’t wait until the month before the show to begin this training. At age 2 1/2 – 3 we begin longlining. 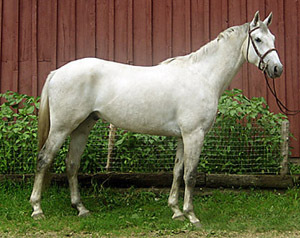 The horse learns to go forward in tack, voice commands and changes of direction, and steering. Depending on their age, we begin canter work in lines.In addition, we longline outside, in and out of the ring, getting the horse used to working with more distraction. Once proficient, we start putting weight in the stirrups, and bouncing up and down, eventually swinging our leg over and sitting. A horse needs time to learn; these first few baby steps are crucial for building trust. Going slower, in the beginning, will pay off in the end. View video of Joe longlining. You wouldn’t drive a car without steering or brakes! Once comfortable at the walk and trot on the line, we then go off the line and work on improving steering and stopping skills. Upon graduation from this level, we begin canter work under saddle, again working on steering and changing direction, leads, and transitions. How long does this take? It all depends on the horse, how nervous or relaxed, and what the owner can comfortably deal with once the horse goes home. Our goal is to make sure your horse progresses through the transitions of training without problems. Unfortunately, horses arrive having encountered problems and we have to start over, not just building trust, but rebuilding. If the foundation is damaged, we have to fix that before we continue, and that takes time and money. So let us build your foundation for you.